Gorgeous Silver Comforters and Bedding Sets! Are you looking for the most beautiful silver bedding sets for sale online? I LOVE silver color comforters! Silver is a very elegant color to have in the bedroom! It is associated with wealth, glamour, prestige, sophistication and success! *Above in this picture is a gorgeous black and silver comforter set for sale! It comes with the gorgeous pillow shams, decorative pillows and bed skirt! It makes a wonderful wedding gift idea! Here are my top favorite ones! What a beautiful and very cool all silver comforter set for sale! I love this unique pintuck sewing design! The fabric is also very soft, since is made from micro plush. I also love the fact that this comforter set comes complete, including the beautiful silver pillows! You can get this impressive and luxurious dark silver color 7-piece comforter set in four sizes, including this gorgeous California King set! I love the gray and silver color combination! The fabric is light and comfortable and the price is also very good! It is also made from a satin like material and it’s very soft and comfortable! This is a 5-piece queen size comforter set but you can also get it in king size. It does come with the black decorative pillow you see in the picture, the bed skirt and the pillow shams. This is definitely one of my favorite silver bedding sets from this page! It is a plush silver comforter! It makes you want to curl up in bed with a book right now! Perfect comforter set for winter time! 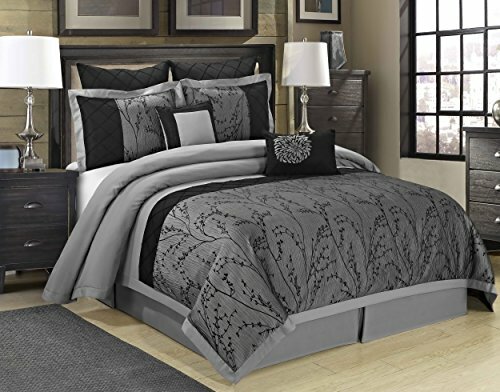 Another favorite of mine is this very elegant black tree branches design silver comforter set for sale! It has a beautiful piercing and pin tucking hand construction fabric. Perfect bedding set to match a gray and black bedroom theme! It feels very silky on the skin as well! Very Pretty SILVER Comforter Set! Here is one of the most romantic and prettiest silver color comforter sets around! I LOVE the gorgeous ruffled design, almost looking like giant silver flowers! It is elegant, beautiful and amazing all in one! If you are looking for a silky, soft and shiny satin silver bedding set for your bedroom, I think you are going to love this one! It comes with one duvet cover, one flat sheet and two pillow cases. Just insert any old or plain comforter you might have inside the silver duvet cover and voila! 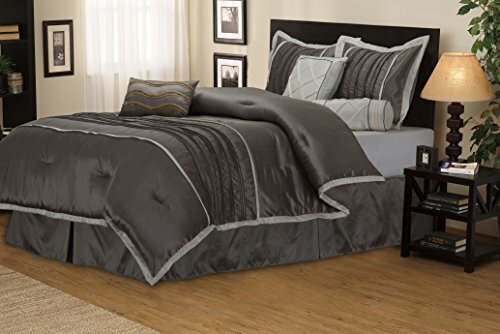 A stain and water resistant silver comforter set! Some buyers said it’s even great against dog and cat ‘accidents’ on the bed! 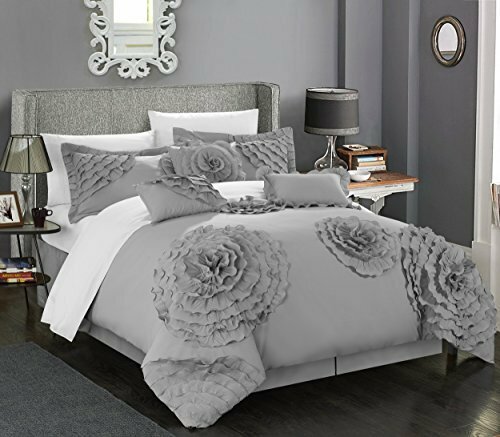 This is a cute and very fancy shiny 4-piece floral silver duvet cover set for sale! It has a gorgeous and very elegant floral pattern and it will definitely make your bedroom look nothing short of a king’s palace bedroom! It also comes with the bed sheet, the fancy silver pillow cases and the duvet cover.